Wow! I had an extremely active day sightseeing. I covered three different states, picked up a geocache, stopped by several places, and got soaked in the process…another dreary day! I was looking forward to finding a campsite that had electric in Massachusetts or New Hampshire, unlike those in Vermont’s State Parks. Instead, I found the most rural one yet…no showers or electric in the bathrooms as they are only pit toilets. To top it off, I am the only one here…a little spooky. I’ll be sleeping with my gun and bear mace tonight! The campsite, however, is beautiful. I’m hoping I will arise to sunshine so I can take some pictures of the three ponds on site. My first stop on the Mohawk Trail or perhaps I should say drive by today was in Williamstown at Williams College. The campus buildings mixed with Gothic stone churches were picturesque. I arrived just as classes let out, so I got to check out the latest styles…shorts with galoshes was the new look! I continued on the Mohawk Trail to Mount Greylock State Reservation. Ten miles of switch backs up a steep mountain road in the fog and rain was to lead me to the summit with magnificent views. I made it about half way and determined views were not an options. As such, the mutts and I pulled over for a hike. We trounced through the forest over wet rocks and leaves to Monkey Tree Falls for a 1.5 mile roundtrip. The trail descended down the hill first. Worried, I hoped the dogs wouldn’t be too tired for the return. Since no one was around and the trail was slick, I let them off the leash. For safety reasons related to both people and wildlife, I normally don’t do that. But I could tell Scout was going to be dragging me all the way, and it would be hard for me to keep my balance with a sprained ankle on slick rock. The dogs had a blast, and the falls were definitely worth the trip. After maneuvering the road around Mount Greylock, I returned to Highway 2 to wind around a hairpin turn…and hairpin turn it was…180 degrees. When the road first opened, cars ascending the mountain used to overheat and their radiators would boil over upon reaching this turn. The car owners would get water from the restaurant here, which is still in business today. Normally, hang gliders use this area as a launching point and the views are magnificent, but today all I saw was fog and a geocache. I felt like I was sticking out like a sore thumb, walking around in the rain looking in the guard rail for a hidden container. As far as caches are concerned, I can check Massachusetts off the list. I drove over several summits today, the next one being Whitcomb. From the summit I descended into a gorge where I found Hoosac Tunnel. The Hoosac Tunnel was considered the engineering marvel of its day. A five-mile-long railroad route, the tunnel took 25 years to build and cost almost 200 lives to open travel between Boston and Albany. Just on the east side of the Whitcomb summit, I spied a historical marker sign in the fog. I decided it was time to pull off the road for the marker since it has been a week or two since my last historical marker roadside visit. Out of the fog came a golden elk! The statue was erected in 1928 and commemorates the brothers of the Massachusetts Elk Association who lost their lives in the World War. Continuing eastward on the Mohawk Trail, I arrived at Charlemont which maintains a strong Mohawk presence. A statue of a Mohawk brave, “Hail to the Sunshine” can be found in a small park to the west of town, while to the east of town, Tribal Groups from all over the Northeast gather at Indian Plaza. While I didn’t anticipate seeing any Indians swapping stories and performing dances in the rain, I was still curious to see what the Plaza looked like. It was a little more commercialized than I expected! 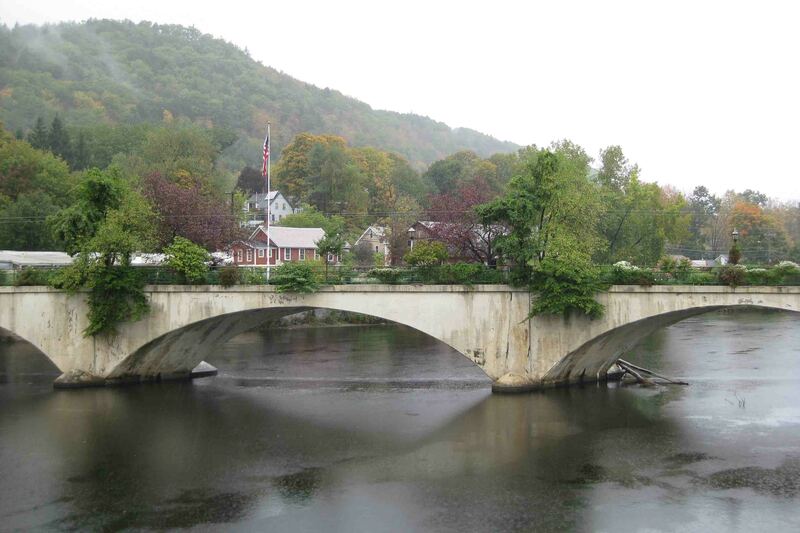 Further to the east on the Mohawk Trail, I stopped in one of my favorite places of the day, Shelburne Falls. What a cute town…and much bigger than I expected. In fact, many times on this trip, when I have expected a town of three buildings, it is quite large, and when I have expected a large, thriving town, it has been quite small. As a result, I have been pleasantly surprised. Aside from the tasty, award winning clam chowder I enjoyed at one of the local restaurants, the town has two special attractions. The first is the base of Salmon Falls where the Indians used to fish for salmon. Boulders from the Ice Age swirled in a whirlpool creating potholes in the bedrock. The potholes range in size from 6 inches to 39 feet in diameter, the latter being the largest pothole in the world. The other attraction is a 400 foot Bridge of Flowers that spans Deerfield River. It was originally built for trolley cars, but now displays flowers along its walls for a beautiful walking path across the river. There were several caching opportunities as well, but my socks and shoes were soaked through, so I started searching for a campground. I had hoped Northfield Mountain Recreational and Environmental Center would have a spot, but it was closed, so I turned north to New Hampshire. The Fall colors in Massachusetts and southern New Hampshire glistened in the rain. I pulled over countless times to get some pictures, yet I’m still not doing the foliage justice! The best shots seem to be the ones as I crest over the mountain top where pull outs aren’t available or by the telephone lines – who wants that in a picture. Yes, my friend Kris could edit out the lines, but I just wouldn’t have the patience. Oh, and if I were Bill right now, I’d have about 3,000 photos! On the wildlife front, I saw some geese and two turkeys. I didn’t know turkeys could run so fast! It was kind of funny to watch. I forgot to report the three deer I saw the other day. Thankfully only one of the three decided to jump out in front of VANilla…the other two waited until I passed. I think that puts my count up to 17 or so. I also saw a GIANT lobster on top of a restaurant! I’m off to try to warm up…ETB. Idon’tknowanyone in Maine but have a friend in Vermont with 100 acres. I’m sure Pete and Cathy would let you stay there.They lived next to me in E.Northport-Pete Liebler 802 888 2954. Also have some friendsin Saratoga. Let me know if you will be near that area. where in Vermont? Will be there tomorrow for part of the day. wow the pothole things are very neat, never have seen that before. Love the road side pic, looks just like I think a New England town should look like with the trees and the little church. Doing good girl & you be very careful in the remote locations. Oh, forgot & so love the flower bridge, looks so inviting. Sounds like you had another busy day! Once again — great photos. I hope you are warm and dry tonight. Snuggle up! ETB…your photos are WONDERFUL ! look forward to them….and your blogs, so well written. They’re like listening to a story each night. thanks for the time and care you take to write them. Happy and dry trails tomorrow ! OMG! I love the giant lobster photo! I would probably travel up there just to photograph it! Haha. You’d still be in Missouri! Btw. Lobster photo taken out of car window while driving. Beth- I am thoroughly enjoying your adventure. You are having the trip of a lifetime. Stay safe!! I am really enjoying your blog. Sounds like you are having soooooo much fun! Keep up the great work with the blog, I enjoy reading it! the photo of the “bridge of flowers” is a painting waiting to be painted ….